Neighborhood design for GEOS involves many community oriented features. 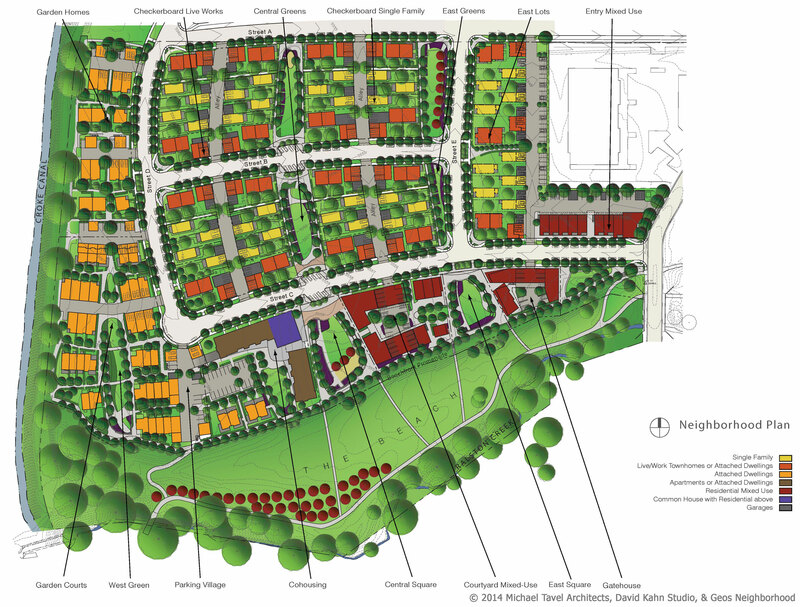 A compact layout of varied housing options provides for diversity and affordability. A prolific pedestrian network of pathways, parks, and civic spaces is anchored by mailbox kiosks, play areas, and gathering spaces for all occasions, large and small. All paths lead to the Ralston Creek Regional Greenway that connects to schools, recreation centers, and urban centers. Processes of nature and agriculture are interwoven at all scales of neighborhood life. Common Greens are surrounded by Fruit tree terraces, and provide shared landscapes for gardening, play, and small scale gatherings. Community gardens and composting areas are dispersed throughout the site. Neighborhood Squares offer terraced landscapes for café tables, seating areas, playgrounds, events, and gatherings. All greens, squares, and private yards receive great sunlight and are semi-enclosed like courtyards. Along the Ralston Creek Trail a seven acre park is devoted to Community Supported Agriculture, recreation, nature play, and wildlife habitat. Geos is comprised of four neighborhood sub-areas that take advantage of special qualities of the site. They provide unique home and living opportunities within the overall community. The Entry Mixed-Use Neighborhood will welcome visitors and homeowners alike to the Main Street District. Distinguished architecture seeks to create a sense of arrival to Geos where sunny and affordable townhomes and condominiums will intermingle with locally owned ground level shops and live/work home offices. The Beachfront Mixed-Use Neighborhood will sit above and overlook a meadow endearingly nicknamed “The Beach.” This area will feature the Central Square and will be considered the heart of social life at Geos. Surrounded by community-oriented facilities, businesses and playgrounds , the Beachfront will make a great place to sit, relax and chat with neighbors. The Beachfront Promenade also will provide a venue for strolling and gazing down on the beautiful cottonwoods along Ralston Creek. 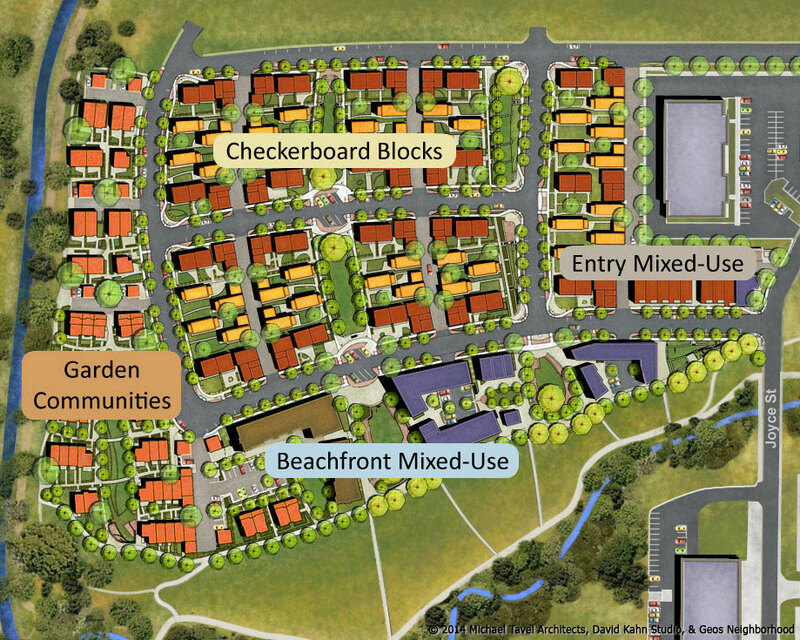 The Garden Community Neighborhood will boast sunny, south-facing homes with private gardens, patios and porches. The homes will have access to small paths intertwined with gardens and parks on their way to the public open space along Ralston Creek. Here, neighbors will enjoy late summer evenings in shared common greens. The parking areas are designed as pedestrian friendly zones with textured or colored paving, trees, small garages and residential carriage units. 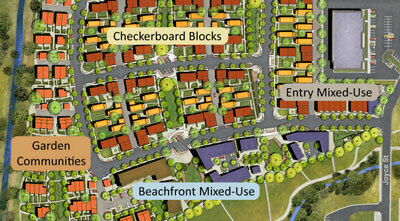 The Checkerboard Blocks Neighborhood is an innovative area based on home types found in historic Colorado neighborhoods. These residences will be positioned for ideal solar access, and have inviting outdoor courtyards and patios. Here you will find live/work townhomes that face well-traveled streets for maximum public exposure and convenience. Single family homes in Checkerboard Blocks will feature front porches facing the park to further enhance a traditional neighborhood feel.